These are sooooo good for breakfast!!!! I literally told one of my co-workers that I wasn't a sweet-tooth last Friday, and then on Sunday I made these Cookies and Cream Cheesecake Bars. It's like me saying that I wasn't a sweet tooth was a personal challenge for myself to not give up on the idea of one day choosing a chocolate bar over a bag of chips in the vending machine. And wow, I was totally like "sorry, salty treats who?' when I started diving into the pan of these things for the first time. Delicious! Even though I claim to not crave chocolate either, Cookies and Cream is one of my ultimate food pairings. Since going gluten free in July it has been a little hard to get my hands on this flavour combo, and I especially miss a Dairy Queen Oreo Cookie blizzard every once in awhile. For these bars, I used gluten free Chocolate Vanilla Creme Cookies by Glutino, and it literally tasted exactly like using Oreos would have. You can also obviously just use Oreos. Or, better yet, do you have any Girl Guide cookies laying around uneaten? Unlikely. 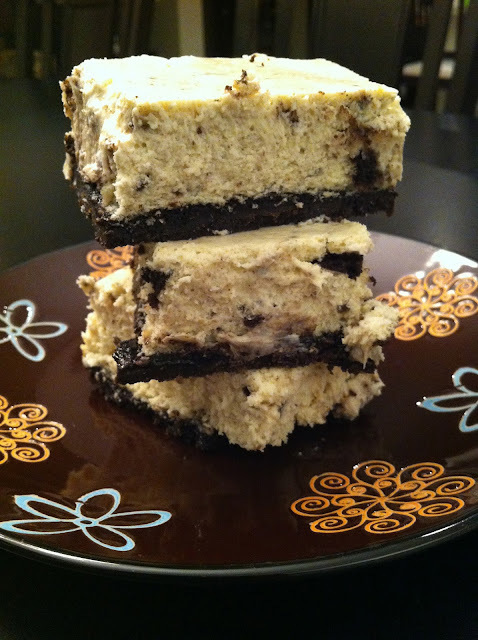 But, if so you could definitely use those or something like Fudgeos in these Cookies and Cream Cheesecake Bars. The crunch of the cookie base is so good in contrast to the soft cream cheese and cookie chunk layer. The final product is almost closer to a real cheesecake than to that of a square, so it's a little messy, but the solid cookie crumb bottom acts like a little edible plate, if you will, and with a napkin on standby you are good to go. It all blends to well together, and I just. want. to. eat. the. entire. pan. And, well, I almost did. But...I used light cream cheese, which gets you pretty close to negative calories I think. Good thing I was able to stop myself before going totally off the deep-end, and instead brought in a plateful of leftovers to my co-workers at work this week. I'm officially back to being a salty-tooth now...until next time (I'd go to 'the other side' for these bars any day)! Kudos to the Recipe Girl blog for introducing me to these cheesecake bars - yum! Preheat your oven to 325F. Line a 9x13-inch pan with foil, leaving a 2-inch overhang on two sides of the pan so that it will be easier to lift out later. Spray the foil with cooking spray. Snap the remaining cookies in half, put them into the food processor, and pulse a few times until the cookies are just roughly chopped. In a large mixing bowl, beat the cream cheese and the sugar together with an electric mixer on medium speed until well blended, about 2 minutes. Scrape down the sides and the bottom of the bowl with a rubber spatula and beat again until everything is mixed together. Add the sour cream, vanilla, and salt, and beat together for 30 seconds. Scrape down the sides of the bowl and mix again. Add the eggs, one at a time, beating well after adding each egg. After adding the last egg, scrape down the sides and bottom of the bowl, and beat one more time, juuuuuust to make sure that everything is totally mixed. Stir in the chopped cookies. Pour the cream cheese mixture over the baked cookie crust and smooth the top with a spatula. Bake for 40 minutes, until the filling is set around the edges but still a little wobbly in the centre when you gently shake the pan. Remove the pan to a wire rack to cool to room temperature, for at least an hour. When cool, cover it with foil and refrigerate until well chilled, at least 3 hours or overnight. Remove from the fridge. Lift the cheesecake out of the pan using the foil overhang, and place onto a large cutting board. Use a very sharp large knife, cut the cheesecake into bars. You will need to rinse off the knife and wipe dry after each cut to get a nice clean edge on the bar. Serve cold. So do you chop up the cookies with the cream inside of them? Seems like it would get more like a paste if I threw them in the food processor. You can do this with the no bake cheesecake also, just add your chopped cookies to the mix and refrigerate till firm. That means letting the crust cool after baking. A nice summertime alternative to having your oven on so long. I don't have a food processor. Will a blender work?